Does it get any better than the delicious combination of green tea, cinnamon, clove, orange blossom and ginger? It certainly does, with the ease of our Chai Tea Concentrate which makes crafting delicious Chai beverages a one step process- just add milk. 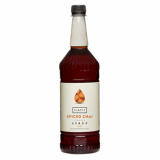 Monin Chai Tea Concentrate is the convenient, premium choice for creating delicious spiced chai teas, hot or cold speciality coffee drinks, dessert cocktails, culinary creations and more. Very aromatic, exotic, distinctive spiced aroma with predominant clove/cinnamon, spiced green tea flavour. Sugar, water, colouring agent: caramel E150b, natural tea, clove, honey and ginger flavourings, natural cinnamon flavour and other natural flavourings, lemon juice concentrate, orange blossom extract.